The Best Customer Service blogs from thousands of top Customer Service blogs in our index using search and social metrics. Data will be refreshed once a week. 2.3 Inside Customer Service - Toister Performance Solutions, Inc.
2.39 The Taylor Reach Group Inc. Customer Service newsletter is a comprehensive summary of the day's most important blog posts and news articles from the best Customer Service websites on the web, and delivered to your email inbox each morning. To subscribe, simply provide us with your email address. 3. Inside Customer Service - Toister Performance Solutions, Inc.
San Diego, CA About Blog The Inside Customer Service blog features tips, trends, and analysis that can help you unlock your customer service team's hidden potential. Facebook fans n/a. Twitter followers 4,613. Facebook fans 43,505. Twitter followers 69,770. St. Louis, MO About Blog Blog posts, articles and tips focused on customer service and experience. Motivational customer service keynote speaker, expert and author Shep Hyken specializes in customer service, loyalty, engagement and customer experience. Facebook fans 5,079. Twitter followers 114,557. New York, NY About Blog Conversocial is a leading provider of cloud-based social customer service solutions. This enterprise-class platform helps global brands revolutionize customer experience, enhance agent productivity and improve operational efficiency by managing the flow of customer service inquiries and discussions on social media channels such as Facebook, Twitter, Google , Instagram and YouTube. Facebook fans 5,994. Twitter followers 19,245. All Over The World About Blog ModSquad provides on-demand customer support, content moderation, social media, and community management services globally. Lots of good stuff you can casually work into conversations at your next networking event. Facebook fans 2,189. Twitter followers 2,339. Facebook fans 1,816. Twitter followers 15,256. About Blog Comprehensive up-to-date coverage for customer service, aggregated from news sources all over the world by Google News. Facebook fans 25,600,149. Twitter followers 214,888. About Blog A places for customers to vent and rage and even smile about their customer service experiences. Facebook fans 1,181,293. Twitter followers 539,573. NYC USA to the world! About Blog Kate Nasser is known as The People Skills Coach and has been helping global teams for the past 25 years. Kate is an inspirational writer and speaker. She blogs about customer service, leadership, people skills, and more. Facebook fans 967. Twitter followers 68,689. About Blog Meet customer service keynote speaker Chip Bell. He educates organizations on how to create a customer-centric culture. Facebook fans 694. Twitter followers 23,830. Austin, Texas About Blog This blog publishes content on essential customer service aspects like marketing, business, e-commerce, and provides helpful tips on how businesses can increase customer satisfaction and revenue. Belmont, CA About Blog RingCentral transforms how businesses communicate and collaborate to unleash their full potential. Today over 350,000 organizations choose RingCentral for innovative and secure ways to connect employees, boost workforce productivity, share knowledge, and strengthen customer relationships. Facebook fans 35,191. Twitter followers 43,725. Los Angeles, CA About Blog Gather customer feedback. Capture leads. Create a contact form. Survey event attendees. And much, much more. With Fieldbloom it’s easy. Facebook fans 128. Twitter followers 6,313. King of Prussia, PA About Blog The SAS blog is your source for customer service stories, call center outsourcing best practices, telecommunications infographics, and important news. Facebook fans 4,147. Twitter followers 4,232. McKinney, TX About Blog Articles about Customer Support Software and how companies can benefit from an excellent software package. Facebook fans 101. Twitter followers 909. About Blog UP! Your Service blog features new customer service, customer experience, and customer loyalty articles and ideas to improve customer service culture. Facebook fans 1,002. Twitter followers 1,175. India About Blog Enhanced VoIP Phone System, Contact Center Software solutions for your enterprise. Reduce cost and redefine communications with Hodusoft VoIP Products. Facebook fans 2,911. Twitter followers 1,148. Makati City, Philippines About Blog Subscribe to Infinit Contact’s customer service blogs and articles on current industry news. Learn more about increasing your company’s customer satisfaction rate. Facebook fans 504. Twitter followers 321. UK About Blog Founded in 1966, Transcosmos is an expert in the delivery of high quality, personalised IT and Customer Support Solutions to blue chip companies around the world. Facebook fans 1,057. Twitter followers n/a. Facebook fans 192. Twitter followers 2,165. Eugene and San Diego About Blog This is a blog dedicated to good and bad customer service experiences with the intent on learning and better serving! Facebook fans 331. Twitter followers 4,637. Facebook fans 84. Twitter followers 35,261. Minneapolis, MN About Blog Service Quality Institute is the global leader in helping organizations keep customers, build market share and improve the performance of the entire work force by developing a culture of delivering superior customer service. About Blog Myra Golden is an author, trainer and keynote speaker who has been helping companies for over twenty years to improve the customer experience through her customer service training workshops. Facebook fans n/a. Twitter followers 12,072. Nottingham & Norfolk About Blog The Squawk Point is dedicated to service improvement. It is full of ideas, news and practical advice for people who run service operations and want to improve their performance. Facebook fans 71. Twitter followers 24,484. New Jersey, USA About Blog As a customer service trainer, coach, author & speaker, Steve DiGioia uses his 20 years of experience in the hospitality industry to help companies and their employees improve service, increase morale and provide the experience their customers’ desire. Facebook fans n/a. Twitter followers 1,284. Ukraine About Blog Read useful tips and articles in our blog section. We provide you only best advices which you can use in your business. Facebook fans 1,033. Twitter followers 79. 39. The Taylor Reach Group Inc.
Facebook fans 26. Twitter followers 763. United Kingdom About Blog Enquire today about our 24/7 telephone answering service and find out how our cost-effective call handling solutions can help your business save money. Facebook fans n/a. Twitter followers 1,185. Canada About Blog A customer service blog with insights for customer service training and customer-focused organizations. Shaun Belding is Customer service and experience expert, keynote speaker; training & consulting. Facebook fans 496. Twitter followers 2,565. Mumbai, India About Blog Trooya is a cloud based Social CRM & social media customer service tool with advanced helpdesk features. Resolve customer queries faster and efficiently, to earn their goodwill. Nairobi, Kenya About Blog ICX Kenya is a professional body for Customer Experience and Customer Service in Kenya, whose mandate is to drive performance and professionalism in the Service Sector. Facebook fans 3,353. Twitter followers 1. Wiltshire SN4 7DF About Blog The customer service training Blog keeps you uptodate with all changes to customer-service-helper.com. Keep up to date when new information is added to the website. Norcross, GA About Blog USAN provides omni-channel customer engagement solutions that can deliver a seamless customer experience and prevent broken customer journeys. Facebook fans 112. Twitter followers 459. Edinburgh About Blog Smart, efficient email management software for exceptional customer service Logicalware is a cloud based customer support solution for the efficient management of inbound email and social media enquiries. Facebook fans 93. Twitter followers 775. San Diego, CA About Blog This blog offer practical tips, insight and inspiration to serve as reminders on how to improve your personal delivery of customer service. Facebook fans 20,299. Twitter followers 26,466. Portland, OR About Blog The blog is probably 85% customer survey news, analysis, and advice. Interspersed are posts on improving customer service, by, for example, branding it. Facebook fans n/a. Twitter followers 854. About Blog Motivational customer service keynote speaker, expert and author Teresa Allen presents customer service keynotes and customer loyalty, customer engagement and customer experience programs. Facebook fans 237. Twitter followers 2,061. Singapore About Blog Ron Kaufman is the world’s premiere thought-leader, educator, and motivator for uplifting customer service and building service cultures. He is the author of the New York Times Bestseller UPLIFTING SERVICE and Founder of UP! Your Service. Facebook fans 6,598. Twitter followers n/a. 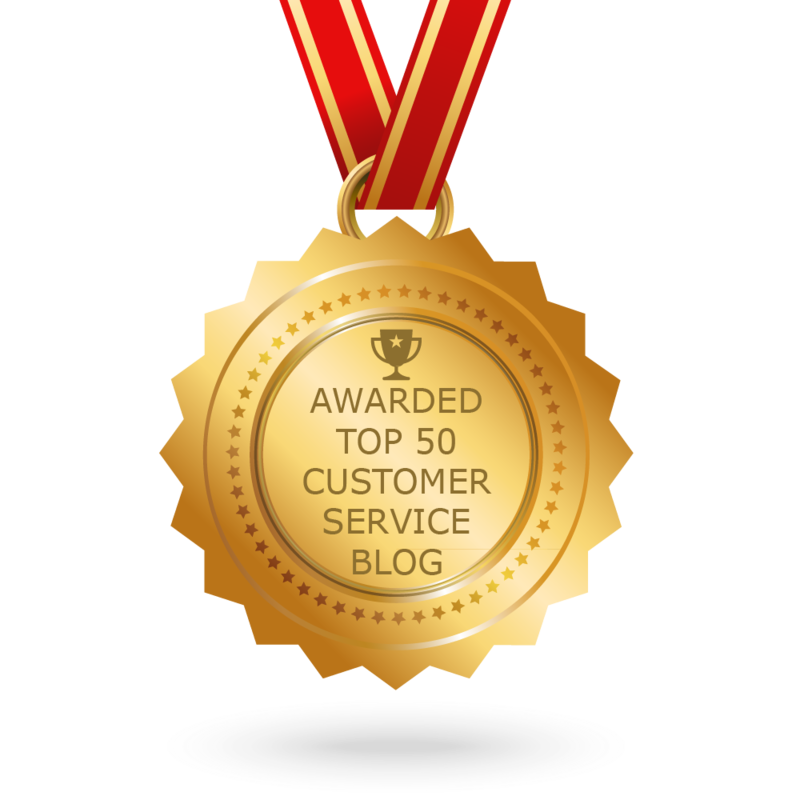 CONGRATULATIONS to every blogger that has made this Top Customer Service Blogs list! This is the most comprehensive list of best Customer Service blogs on the internet and I’m honoured to have you as part of this! I personally give you a high-five and want to thank you for your contribution to this world.